The beautiful island of Mallorca boasts an average of 300 days of sunshine each year. This, combined with numerous excellent beaches, with fine golden sand and clear blue seas, means that Mallorca is understandably a popular destination for tourists. Mallorca is the largest of the Balearic Islands and has many interesting attractions for tourists. 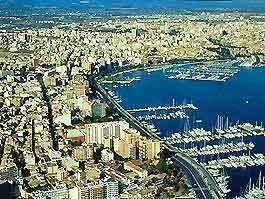 Palma forms the island's capital and is the only true city on this island, being very much central to the tourism scene. The Consell de Mallorca tourist information centre is located in Palma, on the Praca de la Reina, and covers the entire island, together with the Municipal Tourist Office on the Passeig des Born. Central Palma is one of the best places to look for accommodation in Mallorca, although hotels on its westerly waterfront tend to be a little remote for most tourists. Accommodation mainly targets package-tour holiday makers, who usually require rooms near the beach, and hotels next to the Playa de Palma are in great demand, as well as those around the Badia d'Alcudia. Other popular resorts, towns and villages on the island with a reasonable selection of hotels include Banyalbufar, Cala Mondrago, Cala Ratjada, Deia, Estellencs, Miramar, Port d'Andratx, Portocolom, Sant Elm, Soller and Valldemossa. Finding accommodation can be difficult during the peak tourist season (July to August), meaning that you will likely need to book well ahead. Mallorca is blessed by a hot Mediterranean sun that is complemented by cool, refreshing sea breezes, and the winters are considered quite mild. With many popular tourist resorts close to the beaches, there is always something to do on Mallorca, whatever the time of year. There are countless restaurants, bars, cafés and nightclubs, and the island nightlife is legendary, attracting a young crowd. However, away from the resorts of Mallorca, inland towns are fairly undeveloped and offer a more relaxed way of life, with many interesting attractions. Much of the island really does remain quite untouched by tourism and together with other nearby Balearic islands, is popular with the rich and famous. Indeed, a number of A-list celebrities have secluded homes on the hillsides. Attractions in and around Palma de Mallorca include the city's dramatic seafront Cathedral (La Seu) - which was constructed in the 13th century and took almost 400 years to complete; the Parc de la Mar - a tiered park offering splendid views of the waterfront; and the grand Almudaina Palace - a formal royal residence dating back almost 700 years. There are many museums in Mallorca, offering interesting information about the island and its history, which dates back to ancient times and boasts traces of Roman and Arab civilizations. Appeaing art galleries are also present on Mallorca, exhibiting various works of art, such as the Museu d'Art Espanyol Contemporani, which has paintings by Pablo Picasso, Joan Miro and Salvador Dali. Further west, the towns of Magaluf and Palma Nova offer wide, sandy beaches and an exciting nightlife. Other attractions in Mallorca include an excellent selection of water sports throughout the island, golf courses, excursions in glass-bottomed boats, vast underground caves, isolated hilltop monasteries and castles, marshes full of wildlife (attracting keen birdwatchers), and some truly stunning mountains, which are enjoyed by walkers and cyclists alike. The main mountain range on the island of Mallorca is the Serra de Tramuntana, which stretches the entire length of the north coast. 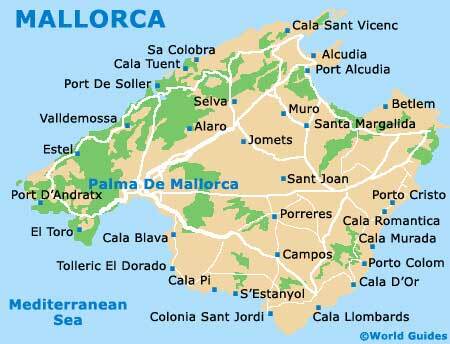 More information about Mallorca tourist attractions. The towns and resorts are easily accessible and Mallorca has an excellent road network, which includes stretches of motorway and also winding, mountain roads, with simply breathtaking views. This island is worth visiting whatever the time of the year, and the popular islands of Menorca and Ibiza are also nearby, being easily reached by ferry.